Dog Attacks – Are the Statistics Correct? A fact that has been bandied about in the British media recently is that the attacks by dangerous dogs in the UK have increased by 12 fold. Over the years I have seen evidence of the inaccuracy of the media, along with a willingness to edit so-called facts on the fly. It was for this reason that I decided to check the veracity, or otherwise, of this supposed 12 fold increase in dog attacks. Unfortunately, I quoted this 12 fold increase in my previous post without checking to see if the facts were indeed true. I really should have known better. This website is a one-man operation, accordingly I cannot afford to pay full-time researchers to do my research for me. Some of the information I present on this site is anecdotal in nature as I have kept dogs as pets for as long as I can remember. Where possible, I will provide online links to source articles and material relevant to my posts but sometimes this material is just not available online. Trying to find the original basis upon which journalists decided that attacks by dangerous dogs had increased 12 fold has at least temporarily, proved to be beyond my means. This does not of course mean that I’ve given up! What I did find however was an interesting website that has been placed upon the web by the NHS. The site is called HESonline.nhs.co.uk. HES stands for Hospital Episode Statistics. This website provides information upon the admission of and treatment of patients within the NHS in England. One of the statistics of this page will provide is the incidence of hospital admissions due to dog bites, or collisions with dogs. While I of course understand that it is relevant to provide information about injuries that relate to dogs I do not feel that it is fair to call a collision with a dog a dog attack. This practice, at seems to fly in the face of good sense. There is a world of difference between being attacked by a dog, teeth bared and being knocked over and injured while playing with an animal or engaged in some other harmless pursuit. Despite my reservations over the statistics some interesting facts can nevertheless be gleaned from the information provided on this site. One of the most interesting facts that is disclosed on this website relates to an event called an FCE, this is shorthand for finished consultant episode. 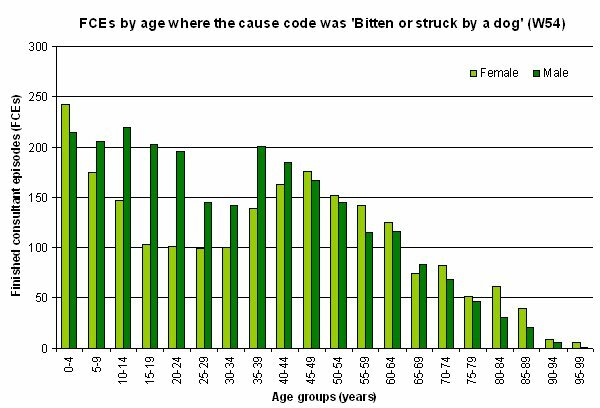 These statistics relate directly to hospital admissions relating to dog bites and dog collisions over a given year. 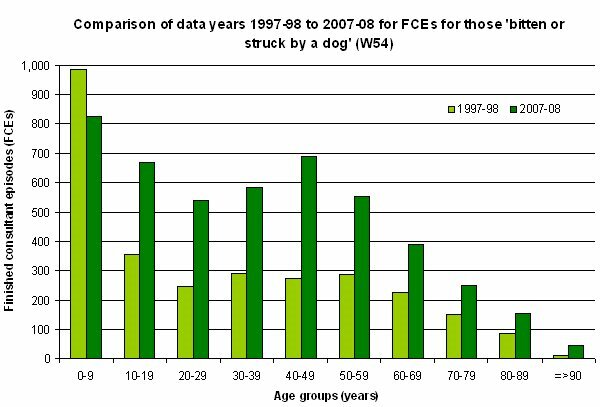 Although based upon these statistics dog bites and dog collisions have increased over the last 10 years the increase is nowhere near the levels to which the media portray it as being. It seems that when data supplied the years 97 to 98 and 2007 to 2008 are compared the number of attacks have indeed increased, but this increase is overall only equivalent to a doubling of the number of dog related hospital admissions. Document images courtesy of HESonline.nhs.co.uk. Another interesting statistic that can be gleaned from these figures occurs in the age group 0 to 9 years. The media has consistently given maximum attention to the attacks of vicious dogs against innocent and defenceless children. This has always struck me as an attempt to create an unnecessary panic in the populace. I was therefore somewhat gratified when the statistics show quite clearly that dog attacks and collisions involving children in this age range have actually declined by approximately 18% over the last 10 years. Now I am fully aware that some may argue that this decline in incidents involving children in this age range may signify that the awareness generated by the press has indeed made the environment safer for children. If this can be proven to be the case, I would of course welcome this news. The problem, at least for me, is that it seems that there is an almost inverse relationship between the amount of coverage the press have given to this topic and the amount of children affected by it. That is to say the media coverage of attacks by dangerous dogs has increased, while the actual incidence of attacks by vicious dogs against children in this age range has declined. While these statistics may provide interesting reading, (at least to some!) they do not really solve anything. Even if we take it at face value that the frequency of dog attacks has indeed increased this says nothing about the reasons why. Until we fully understand the reasons why vicious dogs continue to attack children we will remain powerless to stop it. What is clear however is that the Dangerous Dogs Act 1991 is not achieving the aim of protecting the public. Britain continues to need a new dog law that deals effectively with irresponsible owners, dangerous and vicious dogs and injuries caused by dog bites from these aggressive dogs. I assume you mean a Rottweiler? Sorry, but it is impossible to answer how dangerous a particular dog is, especially without having personal experience of the dog itself. The answer simply depends on too many factors. If you have concerns over a dog you already own, my best advice would be to take it to a vet and ask him his professional opinion. Vets can assess a dog for aggression and other personality traits for a reasonable fee. They can also offer advice on any issues you may be having. Hi i dont have any questions just a thought. In regards to the last question , i would not advise this person to buy a dog of that stature as she has no idea what it means to own a large powerfull breed. I have a male boerboel and two small children and could not ask for more from the dog. Education is the answer i researched my dog aswell as 6 other breeds for well over two years met countless breeders and owners read countless books on breeds, training ect. my dog knows how to act and so do my kids for that . It is really surprising that many owners dont even know what the dog they bought was bred for! It is not the intention of this website to provide legal advice to any person over any matter whatsoever. For this reason I only told the lady to go and visit a person competent to judge in this matter. As you can appreciate, it is impossible to judge individual circumstances over the internet. I really need to ad an FAQ to the site and explain that we do not provide legal advice. It amazes me how many people send emails asking questions about specific instances that I could not possibly have any knowledge of. You make an excellent point that people really should research their chosen breed far more thoroughly. A small cute puppy, might just grow up into an enormous dog – unless you know what you are buying. Taking some personal responsibility seems to be the key that is missing in many cases.